When we released our first version of Burner back in August of 2012, it was a bit of a shot in the dark - a concept we had a bunch of internal validation for - but still something we weren't sure was going to fly like we wanted. In the spirit of shipping the product as quickly as we felt we could, while still making sure the whole thing would work at the scale of our ambitions, we invested a lot of time and energy on our backend at times at the expense of the design of our app. As someone who takes a lot of pride in design, this sacrifice always irked me a bit, even if it was absolutely the right move. The app wasn't the most beautiful, had a slew mismatched button heights or whatever - that kind of design tweakery that one might find in a listicle on a black-on-white-with-lots-of-whitespace design blog. But the thing fundamentally worked - it did what it needed to do, and allowed people to do the stuff they wanted to do that was still simple and effortless. At the end of the day, that's what people mainly need, and for a first version, I think we did a solid job delivering on our promise. But that was also over a year ago, and for a long time we've been wanting to redesign the app with more than just a fresh coat of paint and more consistent font kerning. We have pretty big ambitions for the company, and we needed a platform we could really build on. When Apple announced iOS 7, they gave us the perfect opportunity to redesign the app and become that platform. We took the core guidelines of iOS 7 - keeping the interface out of the way of content, and it's simple / flat look - and used those to make the app even easier to use, more fun to look at, and more futureproof for all of the awesome stuff we've got in the pipeline. Jess wrote up a nice review of the 2.0 app here, calling out some of the main changes and the new look & feel. Rather than rehashing that, I thought it might be more useful to talk about three changes, though they may appear minor, will have a major impact on the app and how we designed them to scale and continue to create value for our users. One of the things I love about Burner is that the more you use it, the better it gets. The more people you call or text, the more interesting the data. I have a number that I just use to call takeout/food places, and it's a great way for me to keep that stuff sandboxed and easily accessible. Before 2.0, these numbers were really just in my call history, and the utility was more or less hidden. In 2.0, we introduce the concept of a Directory, where not only do you have access to your iPhone contacts (maybe less useful, but still interesting), but you also have access to your entire call history from your Burners, creating a kind of data portability that we think is really interesting. 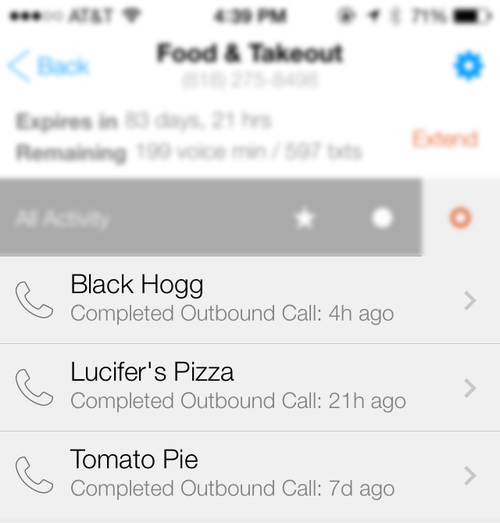 Tomato Pie isn't just an outbound call, but becomes part of an outer circle graph that you can access and catalog across multiple numbers/identities. This is an example of a small design change that not only has immediate utility, but also a long term scalability that we will iterate on and refine over time. In general, v 1.0 avoided having a settings page per Burner number to prioritize simplicity over features. We realized that in order to scale some features while maintaining ease-of-use, creating a settings screen to offload some tasks from the main flow was important. Having these settings allows us to take out some of the clutter of the main Burner detail page, while giving us the ability to experiment with and test new per-number features without distracting from the core use cases. With Burner 1.0, we thought that you could easily create a number in under 30 seconds. For a fully functioning, fully featured phone number we thought that was pretty magic. With Burner 2.0, we think we've gotten that number down to 10 seconds or less to create a number and start texting or making calls. Small optimizations in the "enter number details" flow, increased performance from our server, and a more useful "number created" screen all add up to what we think is a crazy easy, and pretty fun experience. One of our core beliefs is that Burner, unlike Google Voice, makes having multiple phone numbers - like you'd have multiple email addresses - easy. By making the numbers themselves easy and fun to create, we hope to have more people creating multiple lines vs. one "secondary" number. This version more than anything gives us the ability to experiment, not only with features but with design elements in the app. In this new version we've added some fun customization options like changing the skin on the dialer - hint: swipe left. We're excited to try some new things and give you more control over your experience in the app. We've spent a lot of time making Burner better. We've completely redesigned a lot of the app, and hopefully have made the core tasks even easier and faster. We're in love with our new logo and style, and we hope you love it too. We're also hoping you love all the new, amazing stuff this redesign is going to enable us to do. Older PostMeet Burner 2.0: Refined, redesigned and ready to rock!